Comic lovers may soon get a chance to lay their hands on a comic series with a Sikh as its superhero. Super Sikh Comic, a project which aims to bring to life secret agent Deep Singh, has opted to fund the comic series through crowd funding website Kickstarter. With 11 days to go before the online fund raising project comes to an end, the Super Sikh project has already received a pledge of close to US$12,000 from more than 200 backers. This is more than the initial US$5,000 targetted by project co-creators, comic book writer Eileen Alden and Silicon Valley executive Supreet Singh Manchanda. They are partnering Comic-Con India award winning illustrator Amit Tayal. In introducing the Super Sikh project at Kickstarter, the proponents noted that a hero is not defined by the way a person looks, but by a person’s actions. “So we realized that now is the time to show the world a modern hero in a turban. It’s time for a Super Sikh! Empowered by this idea, we created a story about a Secret Agent named Deep Singh, who loves Elvis and hates bad guys,” they say. 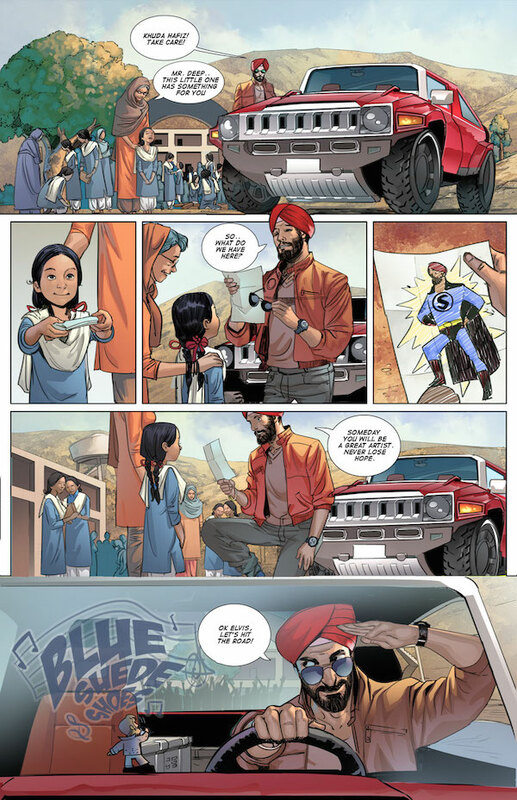 Super Sikh’s goal was to raise US$5,000 for the first issue to create 1,000 full-color 22 page copies of the first series, according to information on the Kickstarter website. With that initial hurdle crossed, the three-person team can now ‘get straight to work’ to produce the next three issues in the comic book. “Perhaps we may even be able to stretch to reach to the goal for our next story series, which features Deep Singh’s cousin Gurpreet Kaur – a scientist with Ninja training,” they pledged on Kickstarter. The Super Sikh project has received some pledges from Southeast Asia pledges, but Eileen said it was ‘difficult to know how many because we don’t collect addresses until the fundraising ends on February 3’. “Right now we are doing individual pre-orders on the kickstarter site and we are happy to ship to Malaysia and Singapore,” she said in an email response to Asia Samachar. Keen to give boost to secret agent Deep Singh? Then head to Kickstarter. A page from what Super Sikh would look like….